Wolf Legend Megaways slot from Blueprint Gaming play the demo! 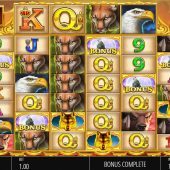 Wolf Legend Megaways slot from Blueprint Gaming features this now famous mechanic licensed from Big Time Gaming and is an original theme rather than one copied from an older Blueprint game, as with Genie Jackpots Megaways for example. Like Diamond Mine and Buffalo Rising Megaways we get a new appearance here although I have to say there are numerous similarities in sounds and appearance to the latter. A desert mesa forms the background and North American animals again feature so it seems a bit of a rehash, but can this wolf transpire to be a legend for our bankroll? We see a Bonanza-style set up on Wolf Legend Megaways with 6 reels of up to 7 rows each and a scrolling row of 4 single symbols above the centre 4 reels. This means with the Megaways varying rows we get 324-117,649 ways in play on any given spin and any winning symbols vanish with replacements from above so multiple wins on one spin can occur. The 6-of-a-kind pays are Gold Wolf 50x bet, Cougar 5x, Buffalo 2.5x and Eagle 2x with 6 card values of either 1.5x or 1x for a full way. Scatters appear on all reels and Wild can only appear singly on the top scroll. As with most Blueprint Megaways slots we have randomly appearing Mystery tiles in the form of a Gold Sunset which all transform to the same icon, maybe creating a win. 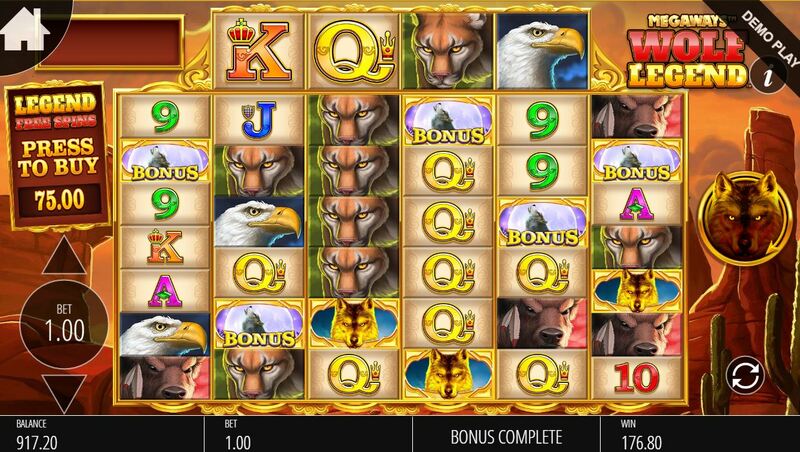 The howling wolf bonus scatter only appears on the main grid and 3 or more trigger the free spins bonus. You get 1 spin per scatter and the these hold in place, the reels darken and respin with only blanks or scatters. If you land another 1 or more, there will be 1 to 5 spins on the scatter and then another respin until you get a dead respin. The scatter overlays are added and that is the amount of spins you start with, but you'll always get 8 minimum. You can gamble the spins on a pie chart and get to choose 1,2 or 3 Gold Wolves, with 3 wolves reducing your winning segment to the minimum. If you lose, feature over. If you win, then you get an extra respin feature with one losing chance for each wolf, which adds at least 2 extra spins for the lowest-risk 1-wolf option. The free spins commence automatically after one winning gamble and feature an increasing multiplier for every winning action, same as Bonanza. You can retrigger the respins feature by seeing 3 scatters on the scrolling reel during the bonus.